One of the few pieces of music that never fails to bring me close to tears each time I listen to it is David Bowie’s Major Tom. The stark image Bowie paints of a man floating alone out in space, separated from earth by hundreds of thousands of miles, knowing he will never return home, goes a step beyond the specific conditions of the place and time in which the song was written. The sense of utter loneliness, isolation, abandon and despair it conveys is absolute. To mention Bowie in connection with the work of Susan Philipsz is not unfitting. The Turner Prize 2010 winning artist is well known for her tender, slightly strained capella rendition of the entire Ziggy Stardust album, a work she made in 2001 which explores the emotional and psychological effects of song, and the impact of the untrained voice in a public space. Ziggy Stardust is the only other piece that forms part of Philipsz’s current solo exhibition at BALTIC in Newcastle. The rest of the cavernous Level 4 gallery space is given over entirely to the UK debut of her haunting new commission: A Single Voice (2017). Philipsz’s work has often been described as a form of ‘sound sculpture’ that you hear long before you see it. A series of 12 discreet speakers positioned evenly around the edge of the room each emit one of 12 staggered violin tones, collectively forming a disjointed, unsettlingly atonal stream of sound. The gallery is presented in near darkness, the only light coming from a monumental screen in the middle, onto which a film is projected. Here the camera pans around a single headphoned violinist, who studies a score on the computer screen before her with fixed concentration, occasionally lifting her bow to draw a note. She is surrounded by an even deeper velvety darkness than the viewer’s, broken only by a large, lunar-like disk and one bright stage light which blinds and eclipses our view with each of the camera’s orbiting rotations. The effect is hypnotic. The 12 ‘tones’, belong to the first violin from Aniara (1959); an opera by the modernist composer Karl-Birger Blomdhal based on an epic poem by the Swedish Nobel laureate Harry Martinson. The story follows a group of colonists who set out for Mars and Venus after Earth has become irreparably damaged by environmental destruction and nuclear war. An accident occurs along the way resulting in the passengers of the Aniara spacecraft being left to float eternally in space. Again, the paralyzing image of Bowie’s astronaut adrift in his tin can, surrounded by an infinite void. Planet earth is blue and there’s nothing we can do. Though very affecting, the exact significance behind A Single Voice is not perfectly clear. 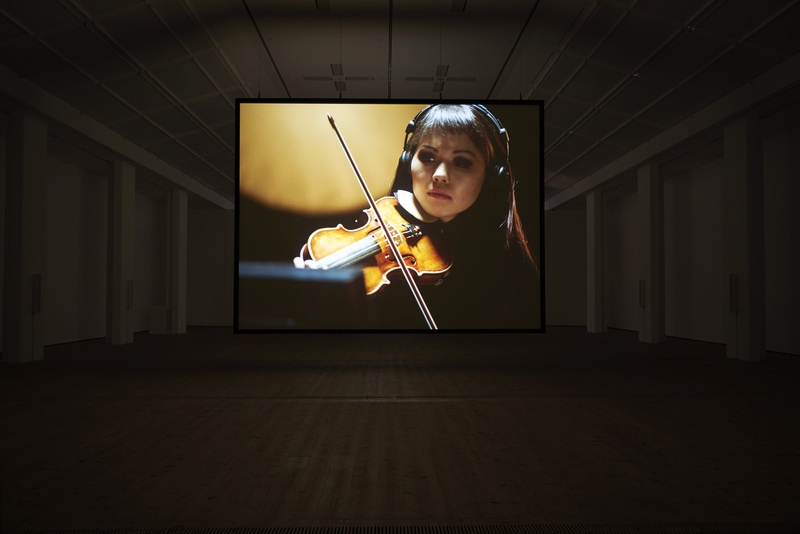 Philipsz has pointed out that the apocalyptic story of Aniara holds just as much relevance today as when the poem was first written in 1956 (arguably more), and the mournful quality of the deconstructed violin combined with the player’s stark isolation as she accompanies an invisible, inaudible orchestra through her headphones, could almost be read as a last chilling goodbye to the human race as it peters into extinction. Yet the piece is definitely much more than a message about global warming or world conflict. A timeless, existential set of questions hang palpably in the air, relating to the fundamentally solitary nature of human existence and our place within the cosmos. Philipsz’s work has long been driven by her interest in how sound can define space, how it heightens our awareness of it and, in turn, how it heightens our sense of self; and this comes to a head in A Single Voice. The viewer is left feeling both immersed and completely isolated in the vast darkened room and, at the same time, are left feeling aimlessly adrift within a sea of discordant sound with no map to help guide us to the safety of meaning. As the strains of violin bleed into Ziggy Stardust (presented in an adjoining room), a chilling emptiness enters the 2001 work – a piece that otherwise evokes warm memories of teenage euphoria and the intimacy of singing alone in the privacy of your bedroom. As the two different worlds within each work collide, their coexistence becomes apparent. Whilst we’re singing to Bowie, we live our lives within the context of a wider nothingness. The same nothingness that lies at the core of Major Tom, and which none of us truly know, yet instinctually turn away from.